I work at a middle school. I’ve been employed there in some fashion for a number of years. My first two years I taught 8th grade US history and coached boys’ athletics. The next year I taught 8th grade English and coached girls’ athletics. At the end of that school year some blood vessels in my brain leaked like so much kiddie pool left to rot in the sun. I taught 8th grade English for half of the next two school years. I came back the next school year as the assistant librarian and have filled that role for going on three years now. Assuming my math is correct (2+1+.5+.5+3), I’ve been working there for 21,553 years – this raises a few questions. Firstly, I’m only 32 years old. Secondly, the school has only been there for 40ish years. Let’s round that figure down to eight school years. I do so enjoy working there and continuing to work with students. Thing is, I’m not like any of the other teachers/professionals in the school. 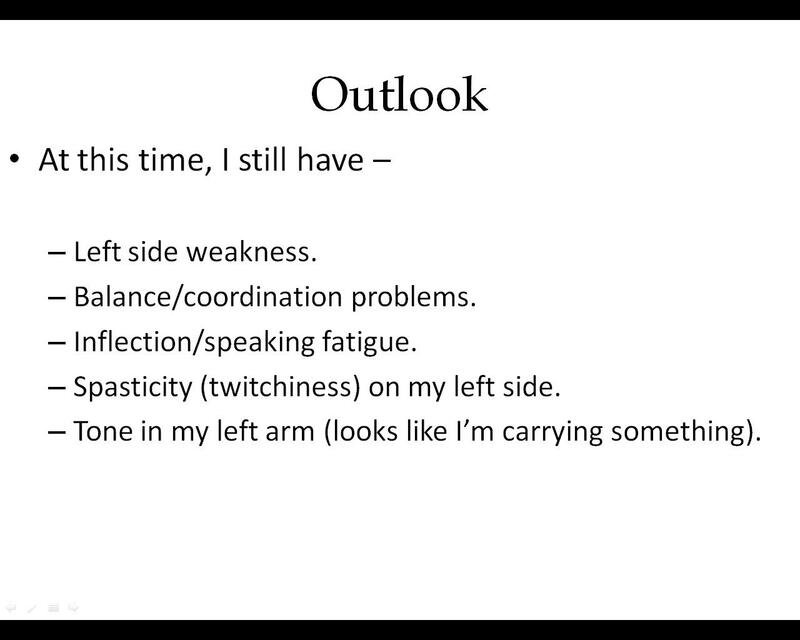 When I returned to teaching after the hemorrhage, I created a PowerPoint presentation about my condition to show to my class to prepare them for my uniqueness. 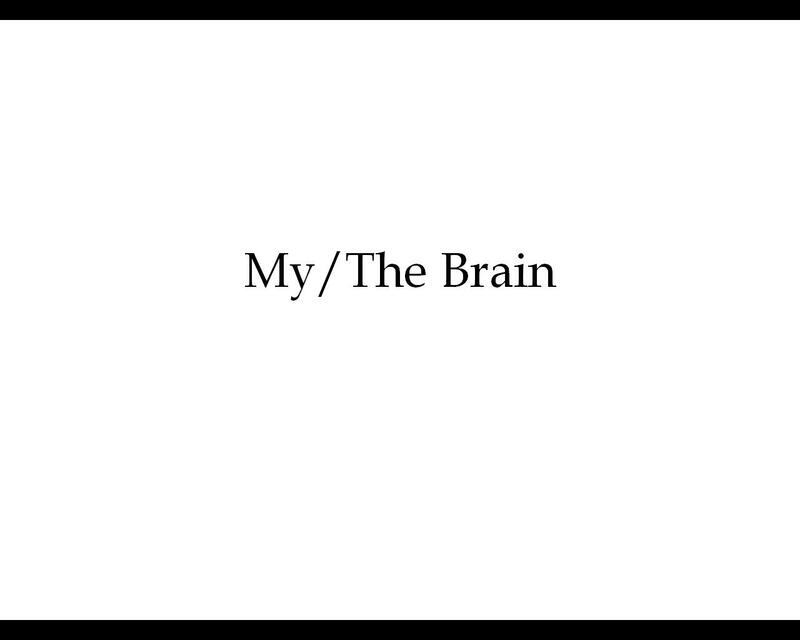 This is the title slide – note that it has the title written (in English, no less!) on it. 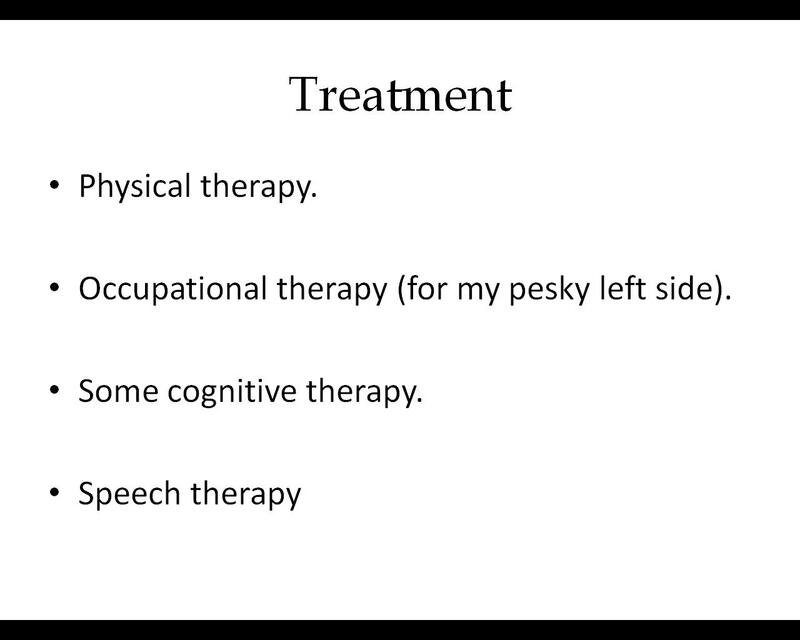 In the same fashion as the previous slide, the students filled in the blanks on the same graphic. 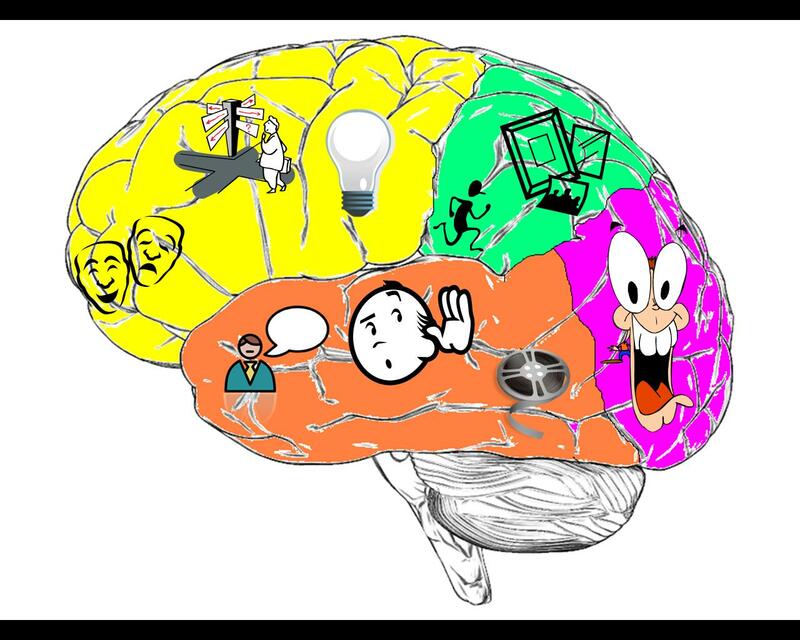 This slide is a pictorial representation (pictoriational?) 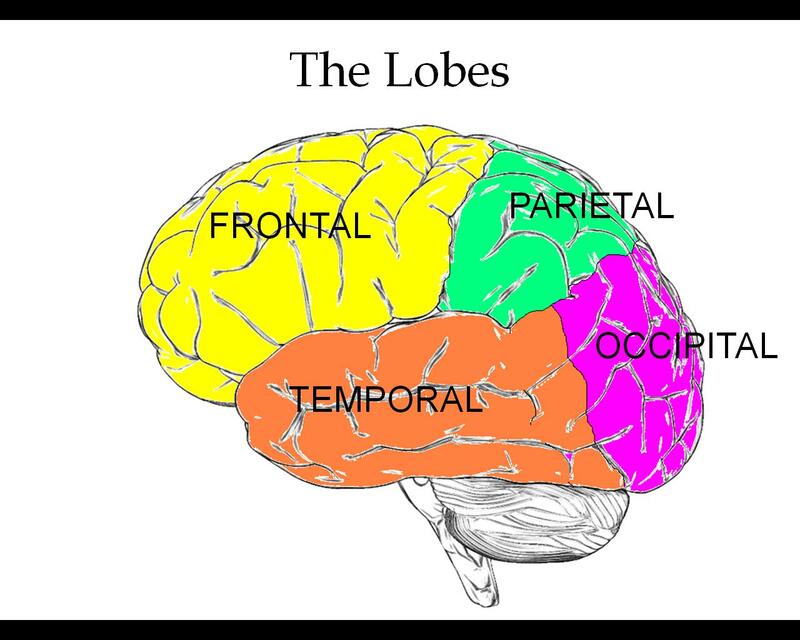 of the functions of each lobe. 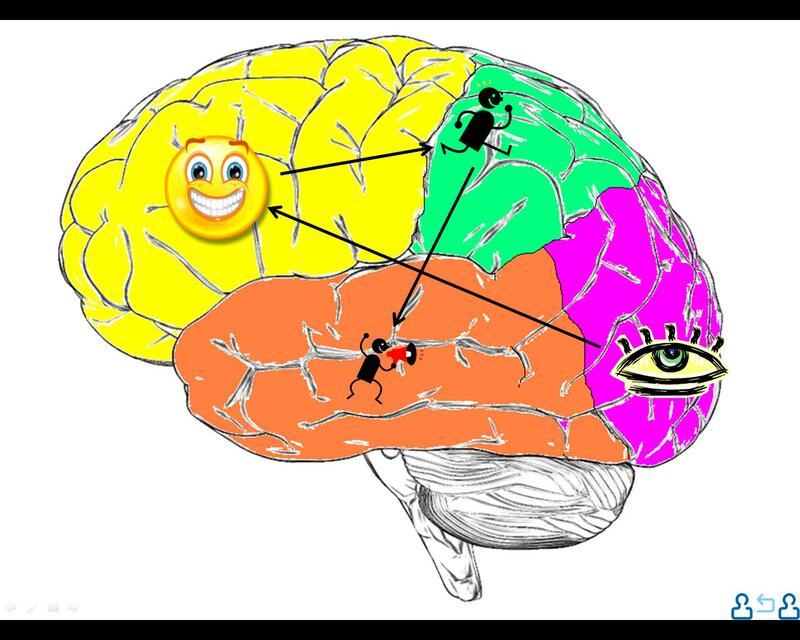 For instance, the temporal lobe (orange) controls the instinct to swat things away from your ear (actually, that represents hearing), and the frontal lobe controls the confusion that comes from staring at gibberish on a sign post (actually, that represents planning). Now we get to my contribution – you see, the seventh grade reading classes at the school where I work are covering non-fiction. 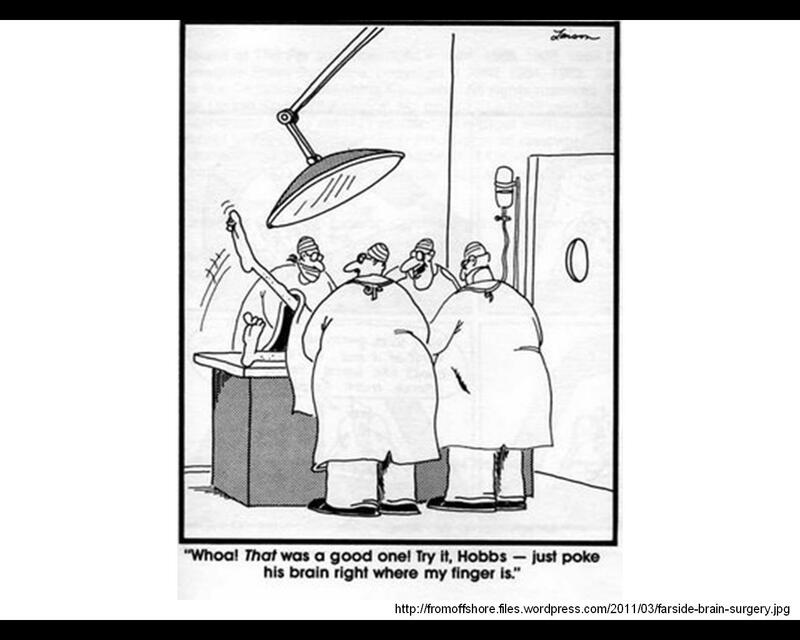 They are reading Gifted Hands by Dr. Ben Carson – the brain surgeon that removed half of a girl’s brain. One of the teachers is a friend of mine and asked me to present my experience as a primer. 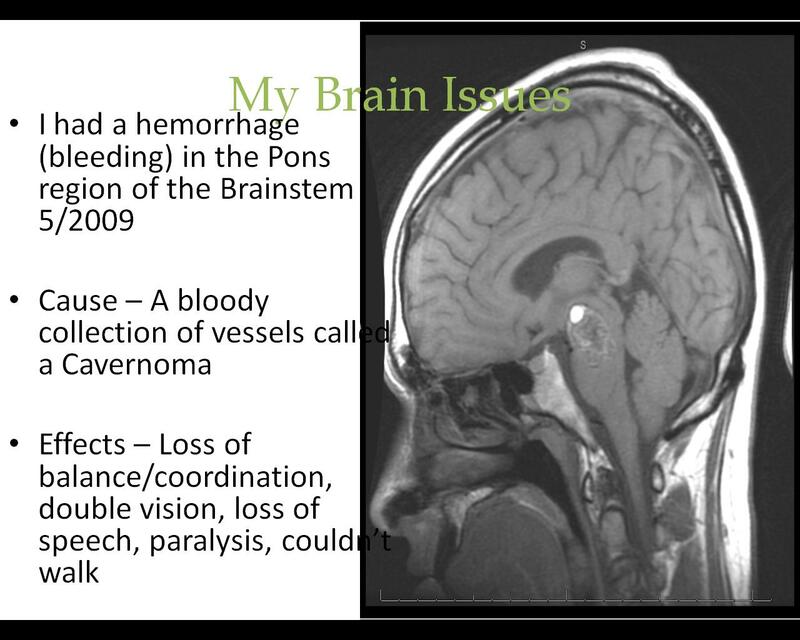 The image in the slide is my brain (isn’t it beautiful?). The white dot in the middle is my cavernoma isn’t it (or rather, wasn’t it) ugly? Not much to say about this slide that isn’t in the slide. I’ll just add that the symptoms listed are enough to get you a 20 minute helicopter ride. A few summers ago I went on a tour of a Nair factory – this happened to be the day that Gillette planned to sabotage the Nair factory. They set explosives…I’m tired of this explanation. It started off with promise, but now I hate it! 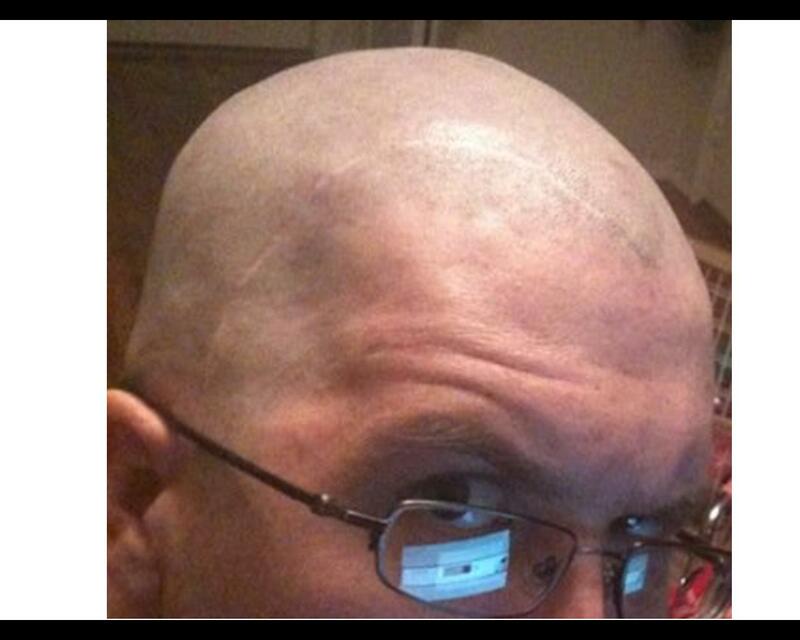 Truthfully, a few summers ago I wanted to see the scar, so I shaved my head. This slide is linked to a file with moving pictures and sound! 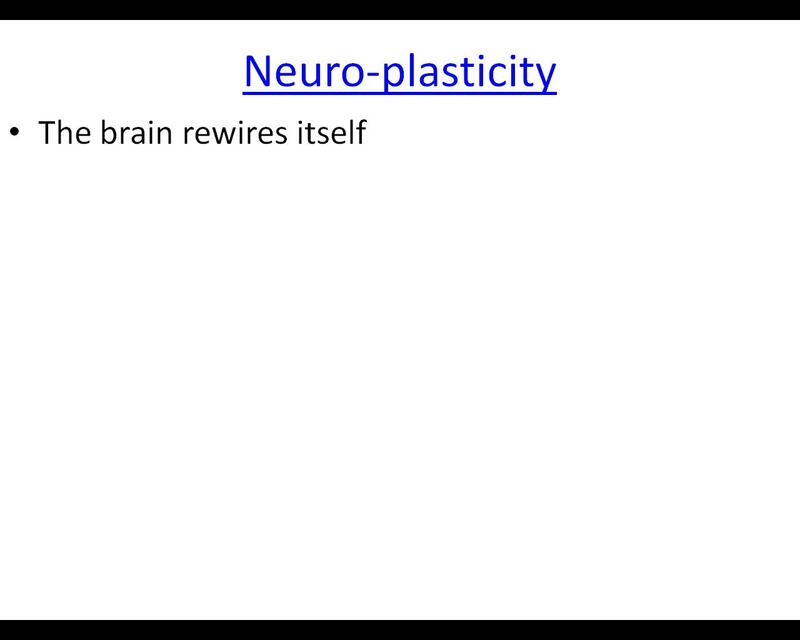 This “video” is about *drumroll* neuro-plasticity! 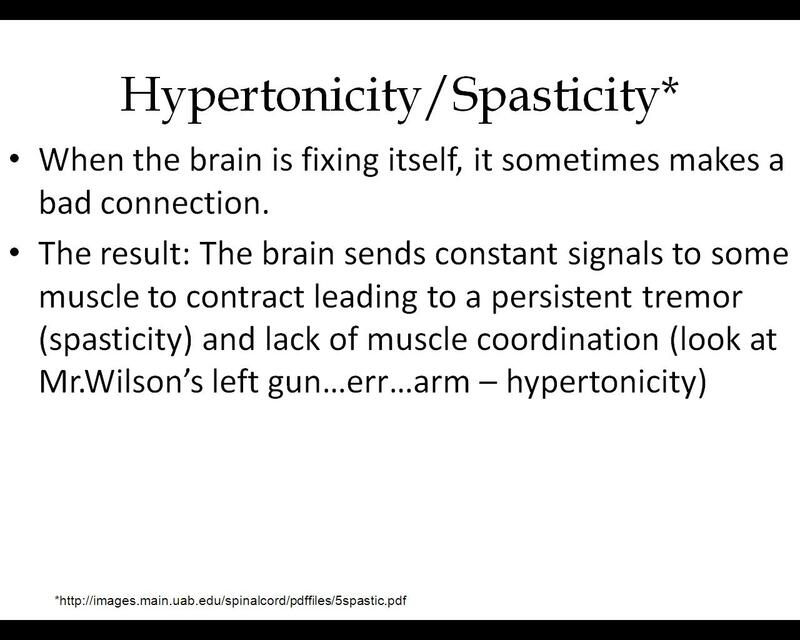 A fancy term denoting the brain’s ability to form new connections. 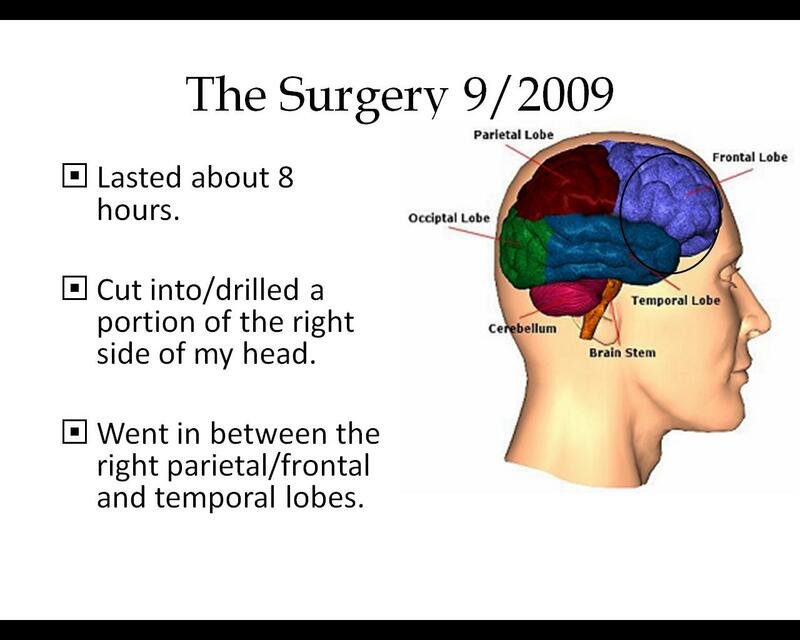 …That blow to the Temple gives you a TBI. 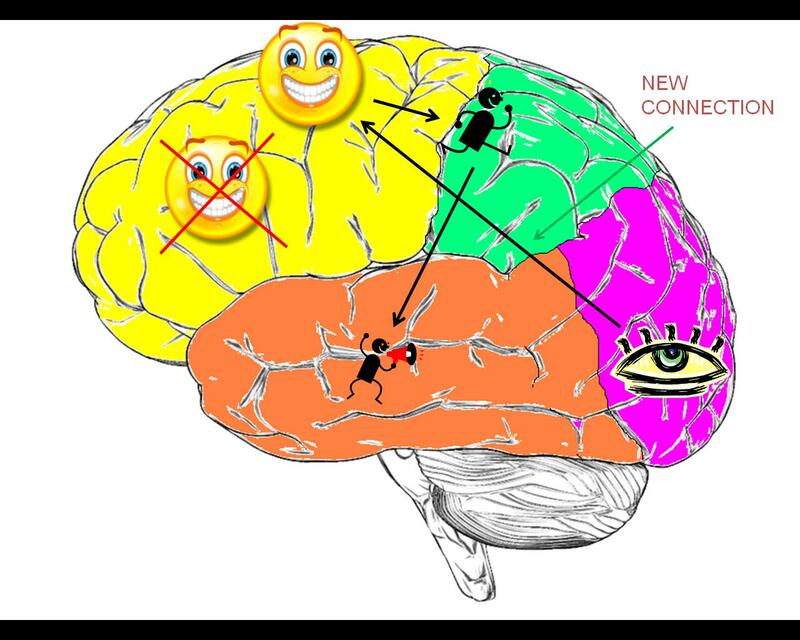 Your brain rewires itself and finds an alternate route to your happy gland. …mention the painful treatments. One thing I’ve learned from working in a middle school is that, as much as the kids want to be treated as adults, they still love to hear about people getting poked with needles and meeting a real life cyborg. I like to pepper in some humor here and there to make sure the kids are awake. 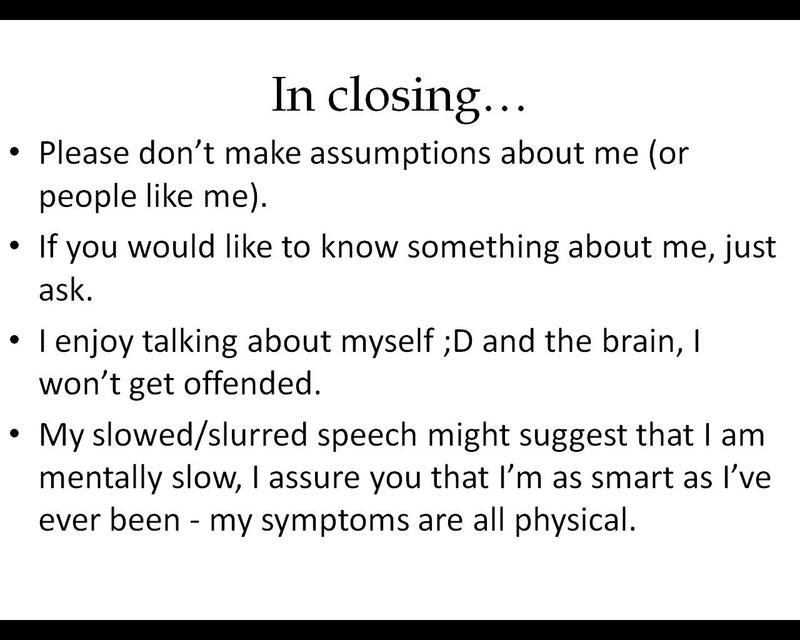 When this slide appears, it’s accompanied by a very loud, obnoxious laugh. I don’t really do any of these anymore, but I mention it because I did it for so long, and it drives home the point that I’ve had a long road. In my mind, all of these will someday be replaced with “Painfully normal”. For purposes of this presentation, it gives the students an idea of what to expect when they see me. It can be difficult to work around young people with my disabilities. Instead of hiding or pretending that I’m no different, I encourage the students to come talk to me if they have a question. I want to think that I’m an ambassador for the disabled. Hopefully, these students will apply what I’ve tried to teach them to others with disabilities. I included the last bullet because I’ve had some students speak very loudly and very slowly to me. You see, they have to tell me their student ID number to check out a book. In previous years, a student or two would speak to me as if I was unable to type and listen at the same time. I’m a pretty smart dude and I can be pretty creative, but I didn’t discover any of this and I didn’t make this sh*t up. If there’s one thing I learned in college, it’s that Keystone Light is super cheap and tastes like weedkiller. If there’s a second thing I learned in college, it’s that plagiarism is bad (I remember a syllabus that said there’s a special place in hell for those that plagiarize). 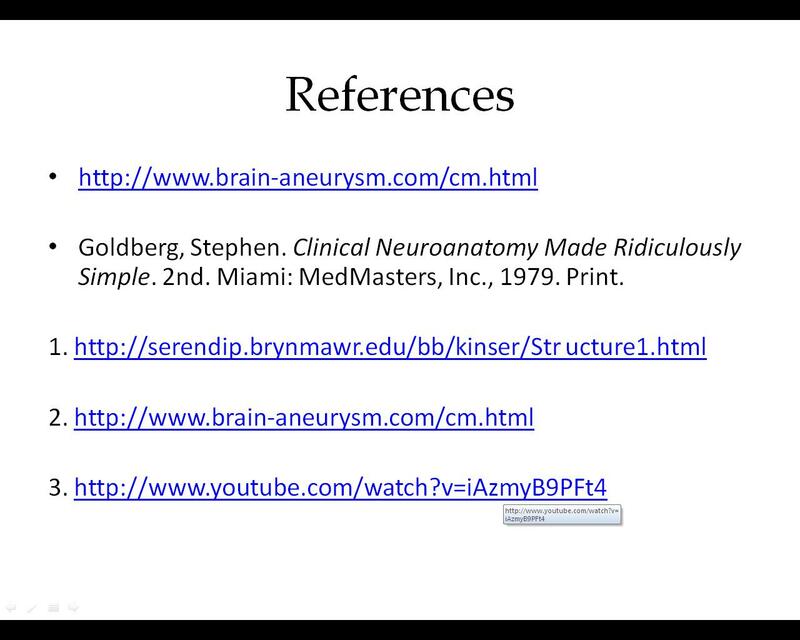 We try to instill that fear into the students, so I model the proper citing of sources. Since our brains have some of the same issues, you will most likely understand if my “Thank you for following my blog” is a repeat. I generally delete the email notification after I’ve replied so I know that I sent a thank you, but on occasions my email list moves and I can’t find the one I was on.